Or Get on the Waiting List! Are you a woman who does not believe your potential is being fully utilized by your organization or are you an executive with female subordinates who you would like to assist in unleashing their fullest potential? The breakthrough ideas of Leadership for Women Only focus on the challenges facing female executives. It is a dialogue a woman rarely has. It addresses development concerns that are uniquely “feminine” and quite distinct from your male counterparts. You will rediscover (and learn to rely on) those innate “feminine” attitudes and skill sets that are the foundation for attaining true authority within your organization. The result is a reframed perspective from manager to leader. Maybe you are not sold on a Women’s Only program, after all you think, I’m competing with men; why would I want to separate myself by attending a leadership program exclusively for women? PLEASE KEEP READING. you are frustrated because you want to be a compelling force in your organization—just not at the cost of losing yourself. I’d wanted to promote her for several years yet could never get the leadership team on board until now. She has a whole new approach since taking the program. Thanks. I’m not sure she would have accepted–clearly she was leaning toward not taking the assignment until she worked with you. Her future is now unlimited. In today’s competitive marketplace, producing superior results depends not simply on your expertise—an area in which women excel—it requires mastering critical yet subtle elements for long-term career success. The structure of Leadership for Women Only allows you to tackle issues specific to feminine leadership in a safe environment with a pioneer in the field leading the dialog. This program offers an opportunity to master what you didn’t know you don’t know yet this is exactly what will move your career forward. The unrivaled approach of Leadership for Women Only presents the kind of challenging dialogue women have never been introduced to before. I know. I know. Your calendar is already jammed 24/7 with work. Carve out the time to attend Leadership for Women Only. You will be glad you did on returning to work and begin capitalizing on the practical, relevant and applicable secrets you learned. This program is an investment in your long-term career by you and your company. How do you get recognized by Senior Management in a good way? What ability must you nail to earn $25,000 more a year? How do you manage your to-do list to work powerfully for you rather than against you? Take Advantage of New Opportunities: Businesses now understand the importance of women contributing at the highest levels—but if your skills don’t match up; you won’t be able to take advantage of this tipping point for females. Better Career Results with Less Effort: Our events, networking and continuous knowledge-based development opportunities exclusively target key empowering concepts for women. Unless you know the rules, you have to work much harder to achieve career recognition. Once you’ve enrolled, start envisioning what Leadership for Women Only can do for you. Imagine how you will feel when you gain the skills to overcome any corporate barriers and redefine your future. If you’re interested in more details regarding Leadership for Women Only, please click here to access it. If you want to speak to me directly, call 970-384-2254. 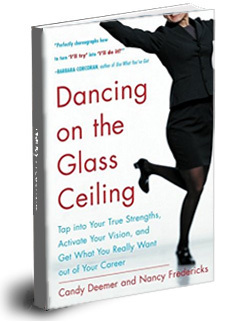 Sign up to be notified about upcoming Leadership for Women events so you can start dancing on the glass ceiling too! Awesome! We will let you know.